GeoKs adopted a cache in early September and 2 days after the adoption went through somebody logged a DNF, saying they figured the cache was under water as a result of the spring flooding along the Elbow River. We disabled the cache and finally got around to checking on it today. Sure enough, the course of the Elbow River has changed dramatically since we found the geocache in question back in 2006. "Ground Zero" is right around the log in the foreground of the photo. 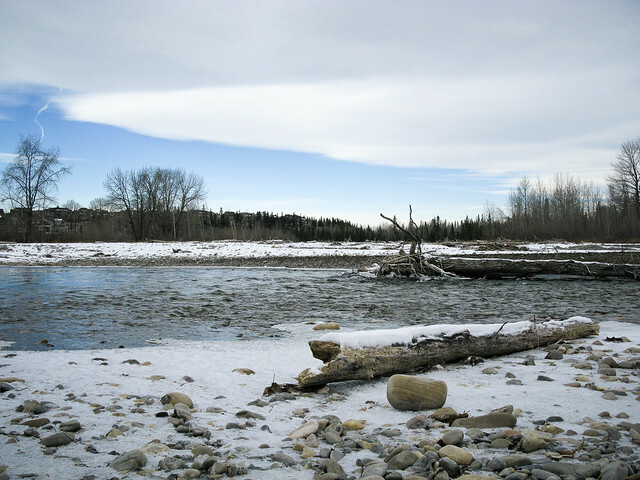 The log is sitting on an island in the middle of the Elbow River. And it’s about a meter lower than where ground level used to be, so visiting this spot really lets you appreciate just how powerful the spring flood was! Since this cache was originally hidden to mark another geocacher’s 2000th find, we’d like to keep it going. But since this area has flooded twice in the past 4 years, we’re thinking another area might be a better hiding spot for the replacement container. Stay tuned for more news about GCYCHH – nicolo’s 2,000 geocache finds. I also enjoyed a 5 km walk through Discovery / Griffith Woods, searching out 3 geocaches along the way. Piper Dog did a nice job on the camo for both "Griffith’s Hollow" and "Griffith’s Hole". And Team DKRC did a nice job on their first hide "RC #1", which took me to a natural area in Discovery Woods that I’d not seen before. Considering it’s the 24th of November, the weather was great: mostly overcast, with some blue sky over to the west with the temperature at a very comfortable 7 Celcius. I just did the math this morning. Taking into account our three geocache finds today, we need just 30 more by the end of the year to log 1,000 caches in 2008!! Guess it’s time to get back to caching!